The Landing Grill and Sushi Bar on Westlake Lake! $15 for $30 Worth of Food and Drinks For 2 or More. YOU MUST BRING YOUR PRINTED CERTIFICATE WITH YOU TO THE RESTAURANT! Traditional and specialty sushi, Asian cuisine, grilled dishes and more! 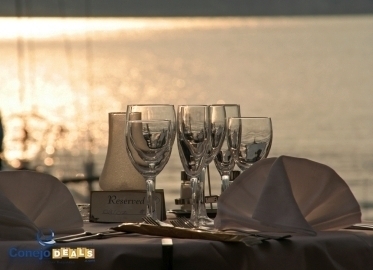 We could go on and on about the many attributes of The Landing--the expert staff, the beautiful location right on Westlake Lake, the fact that they are open for both lunch and dinner--but we think it best to let their ridiculously extensive menu speak for itself. Since my brother Rob and sushi don't mix, he is going to select between one of the many scrumptious grilled dishes like Grilled Salmon with dill lemon beurre blanc sauce, the Blackened Ahi Tuna, the Grilled Korean Style Marinated Flank Steak, the Chicken Picatta or Marsala, or the Rack of Lamb served with a classic mint sauce. If Meredith, our Director of Customer Service, is in one of her salad moods, she will have to decide between the classic Greek Salad, the popular BBQ Chicken Salad, and the Spinach Chicken Salad. On the other hand, if she is having a pasta day, she will likely opt for either the Chicken Pesto Pasta, the bowtie with sautéed Shrimp, or the classic Vegetarian with garlic in a white wine sauce. I almost forgot to mention my absolute FAVORITE thing about The Landing! They are inviting Conejo Deals' members to indulge for 50% off! P.S. We have a limited supply of certificates available, so if you want to "land" this deal, buy early!